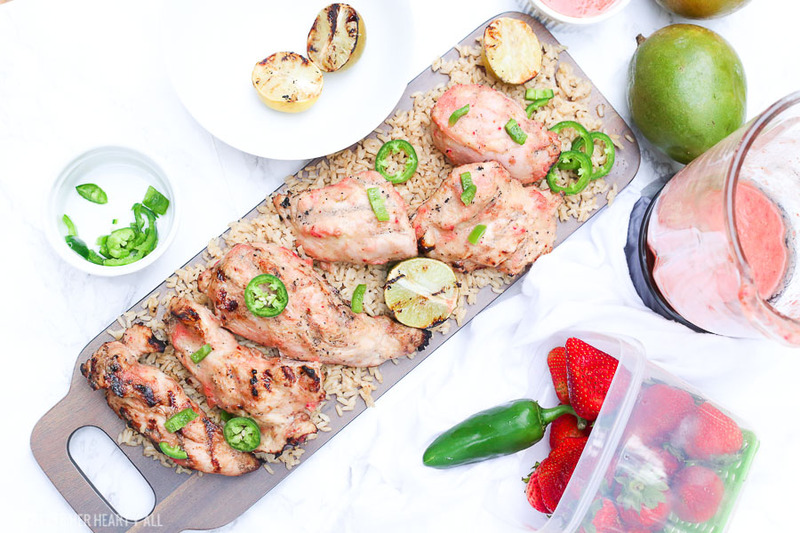 Grilled strawberry mango chicken with fresh jalapenos and grilled lime on a bed of fluffy brown rice! This healthy delicious meal puts a light tropical flavor in every bite! 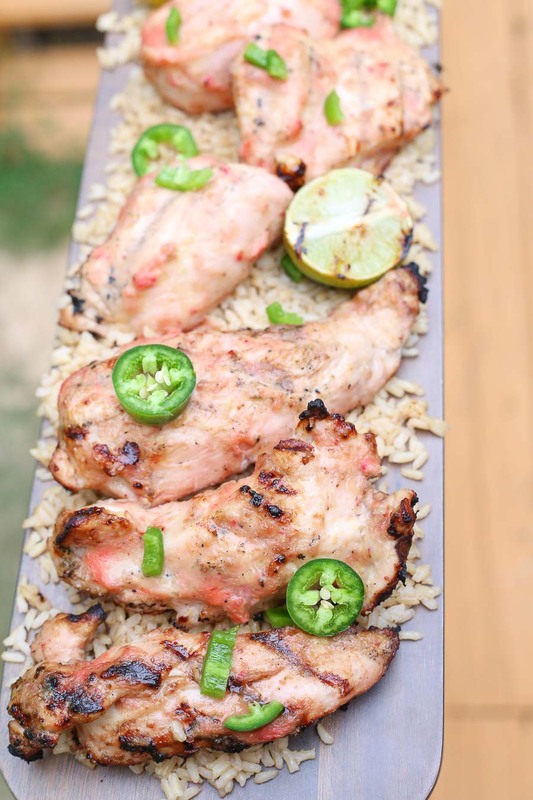 Strawberry mango chicken is made by marinating chicken breasts in a strawberry mango marinade and letting it chill in the fridge for 30 minutes to 3 hours before grilling. The marinade consists of fresh strawberries, mango, and jalapeño, red onion, garlic, coconut oil, and vinegar. 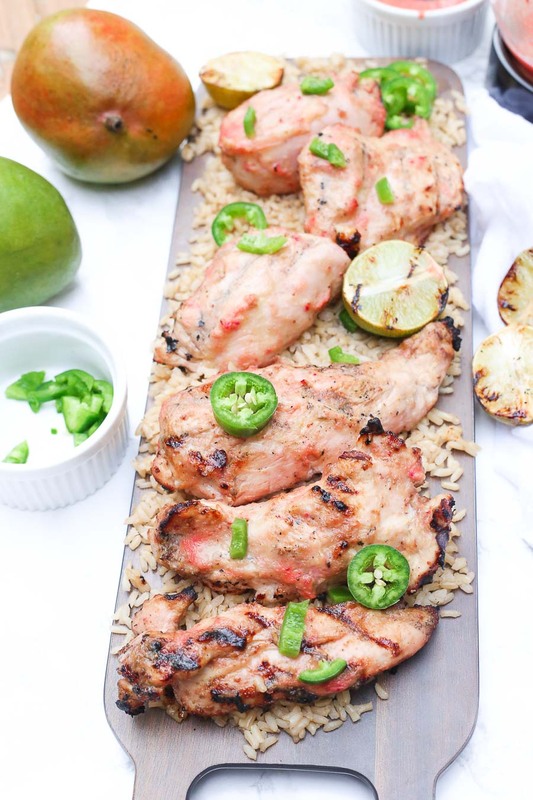 The strawberry mango marinade brings out sweet flavors from the strawberry and mango, combined with savory flavors of the garlic and jalapeño, with tropical flavors of the lime, coconut oil, and mango. It’s light and refreshing but still able to pack a punch of tropical Caribbean-like flavors. I like to combine my grilled strawberry mango chicken with fluffy brown rice or quinoa or lay it on top of a layer of dark green veggies. On top of my strawberry mango chicken I like to sprinkle chopped jalapeño slices and a little bit of crumbled cheese. 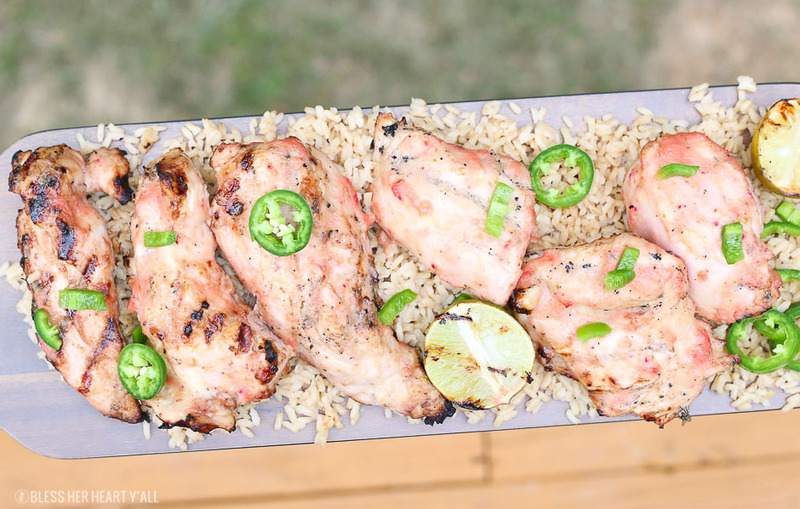 On my grill my thick chicken pieces are cooked between 6-7 minutes per side. 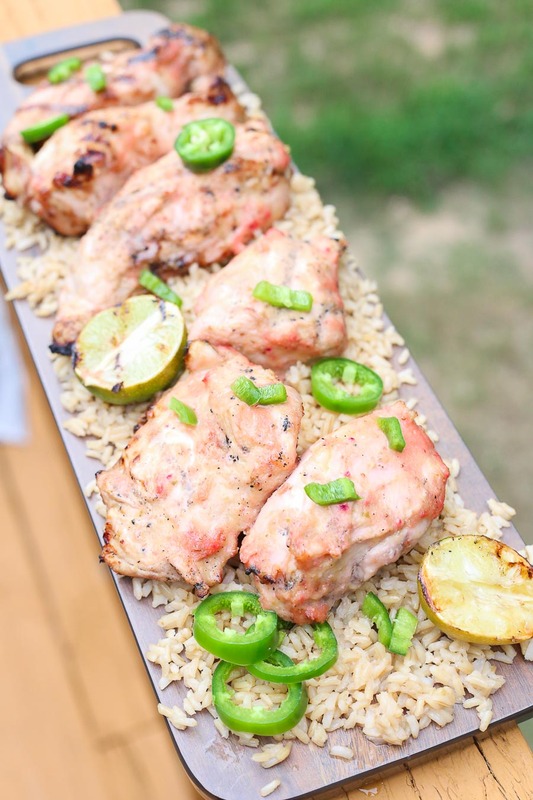 I like to add in a brush or two of extra reserved marinade to each chicken breast side while grilling and for dunking bites in for those sauce lovers you are at your dinner table. This recipe is gluten-free, low carb, and dairy-free if you leave out the cheese crumbles as a garnish. It’s a low fat and high-protein option that the entire family will love! Combine all the strawberry mango marinade ingredients together in a blender or food processor and blend until smooth. Place the chicken and 3/4 of the marinade in a large zippy bag and chill in the refrigerator for 30 minutes - 3 hours. Start your grill and rub a bit of oil on it. Once heated place your marinaded chicken pieces on it and cook the chicken until fully cooked (internal temperature of at least 165*F), flipping once. 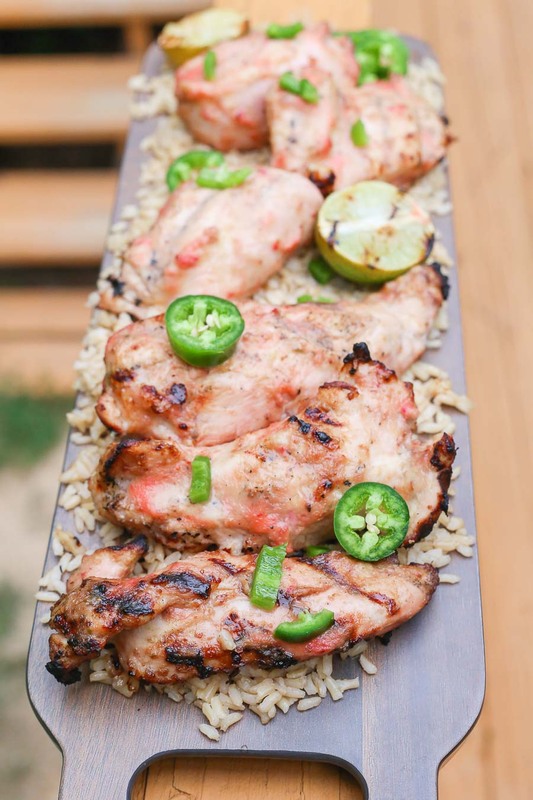 While grilling you can use the reserved 1/4 strawberry mango marinade to brush on more sauce. Remove from the grill to cool. Sprinkle with jalapenos, grilled lime juice, and cheese crumbles and serve with rice or vegetables. 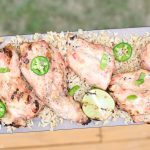 I like to grill a few lime halves with my chicken to use as a quick flavorful spritz along my final dish along with my jalapeno pieces and cheese crumbles. I place each half, flat-side down directly on the grill for 2-3 minutes and remove while still warm and juicy. Looking for more chicken recipes for inspiration? Check out our gluten-free chicken recipe page!